Parashat Sh’lach L’kha is perhaps one of the saddest of all our weekly portions. We not only read about how our people rejected the Holy Land, but we also read about the tragic subsequent judgement in which a whole generation was condemned to perish in the wilderness. Indeed, our sadness is exacerbated by the thought that it really ought not to have been so – that our ancestors might have chosen another, better path. After all, that generation could claim Avraham as their progenitor, and what a man he was! Hearing the voice of Hashem, Avraham had uprooted his family and had trekked hundreds of miles across dangerous desert country until he finally arrived in Eretz Yisrael. Once there, Hashem promised Avraham that although his descendants would be enslaved for several generations, He would bring them back so that they could take possession of the Land. In this, as in every other aspect of his life, Avraham trusted Hashem. Such was the magnitude of Avraham Avinu that he believed the most incredible, improbable promises with the simplicity of a child. But what of his descendants, in particular the generation that stood poised, in Parashat Shlach L’kha, to enter and conquer the Land which Hashem had promised to them through Avraham? That this generation chose to send spies into the Land in order reconnoiter it was not an issue. Sending spies in advance of an army was regular practice in ancient times. Thus Yitro served as the “eyes” of Israel as our ancestors traversed the desert. So also, Yehoshua commissioned spies at the time of the conquest. 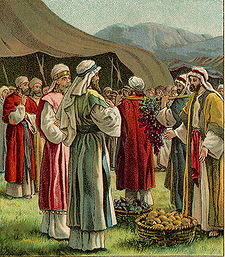 Indeed, Moshe himself raised no opposition to the people’s request for spies and duly instructed them to observe “the people living there, whether they are strong or weak, few or many” and “what kind of cities they live in, open or fortified.” The people’s sin did not therefore consist in their request for spies. No, it was not for this that they were duly judged but for their faithless acceptance of the spies’ evil report concerning the Land. “We can’t attack those people,” the spies said, “because they are stronger than we are…. The land we passed through in order to spy it out is a land that devours its inhabitants. All the people we saw there were giants! We saw the N’filim, the descendants of ‘Anak, who was from the N’filim; to ourselves we looked like grasshoppers by comparison, and we looked that way to them too!” It is clear that in their report the spies went far beyond the parameters of their commission and, sadly, so the Torah tells us, the people chose to believe them. Thus that generation rejected all the promises which Hashem had made concerning them through Avraham. Like father like son? Could these really be the descendants of Avraham? By bloodline of course, but surely not by faith?! There is more to Jewishness than physical descent, as Moshe himself often asserted: “circumcise the foreskin of your heart; and don’t be stiffnecked any longer”. The events of our parashah cut right to the heart of what makes us Jewish. Real Jewish identity is only partially related to physical descent. Indeed, such descent means very little if we do not also possess the simple trusting faithfulness which was found in our progenitor, Avraham. Such faith impels us to say ‘yes‘ to the promises of God, however impossible or improbable they might ostensibly appear. Without such faith we cannot properly be ourselves or relate to Hashem let alone fulfil our divinely appointed task to be a light in a dark world. If only the generation that perished in the wilderness had made a different choice! But although it is too late for them it is not too late for us. So today, let us say ‘yes‘ to Hashem and to all His promises. Let us truly become children of Avraham Avinu and become a people of faith.